FCI Tucson is located within Tucson city limits, 10 miles southeast of downtown Tucson. Opened in March 1982, the institution was originally a metropolitan correctional center designed for a capacity of 392 inmates. The staff numbered 237 as of 2002. The facility houses approximately 770 inmates. Males are held in two-person medium security cells, and there is an administrative facility for both male and female offenders. The prison mainly holds pretrial inmates from federal court proceedings in the District of Arizona as well as short term and sentenced inmates awaiting transfer. †Inmates released prior to 1982 are not listed on the Bureau of Prisons website. Charles Keating 97188-012 Released from custody in 1998; served 5 years. Owner of the now-defunct Lincoln Savings and Loan Association; pleaded guilty to bankruptcy fraud and wire fraud for stealing nearly $1 million from the company prior to its failure in 1989, which cost taxpayers $3.4 billion. Abu Khalid Abdul-Latif 40739-086 Now at FCI Sheridan Pleaded guilty in 2012 to conspiracy to murder US officers for plotting to attack recruits at a Military Processing Center in Seattle, Washington with grenades and machine guns; co-conspirator Walli Mujahidh received 17 years. 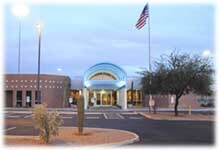 ^ "BOP: FCI Tucson". Bop.gov. Retrieved 2013-01-04. ^ Shain, Jeff (October 3, 1996). "Charles Keating Released From Jail". Associated Press. Retrieved 27 October 2013. ^ E. Scott Reckard; David Rosenzweig (April 7, 1999). "Keating Pleads Guilty to Fraud; Legal Saga Ends". Los Angeles Times. Retrieved 27 October 2013. ^ "FBI — Seattle Man Sentenced to 18 Years in Prison for Plot to Attack Seattle Military Processing Center". Fbi.gov. Retrieved 2015-11-03. This article about a building or structure in Arizona is a stub. You can help Wikipedia by expanding it. This page was last edited on 15 April 2019, at 00:28 (UTC).